I don’t have enough sun to grow morning glories in my yard, so I take advantage of others’ lovely pink and purple trumpets. For years I’ve photographed the morning glories that come up from seeds along the wrought iron fence by my neighbor’s white barn garage in the alley near me. Then one year they were not there, and never have been again, and I miss them, but this morning reminds me so much of the year when I spent way too long photographing them. I’m so glad I did. I have been kind of obsessed with morning glories in alleys lately—they’ve just suddenly sprung up so I’ve shared some of my old favorites, draped over old fences and gates and growing up downspouts, but I’m trying not to spend too much time on them right now when I’m really busy. They got the better of me one October day a few years ago, and after a GB+ of photos of the lovely purple and pinks by the white barn and a quick scribble of a thought I decided to spend some time on something I visualized while photographing and finishing my walk home. The thought was a very literal one—I should get home, I had things to do before the end of the day and if I hadn’t encountered such exuberant and colorful beauty while walking down the alley I would probably have been home already. But I wouldn’t have these many photos of morning glories, each of which I’ll use somewhere sometime, even if I only look at them one winter day, and I wouldn’t have that sweet spontaneous, the exercise of my creative intellect from coming upon such beauty that had me let go of what I needed to do, only to come back and do it better than I would have if I had ignored the morning glories and come straight home. 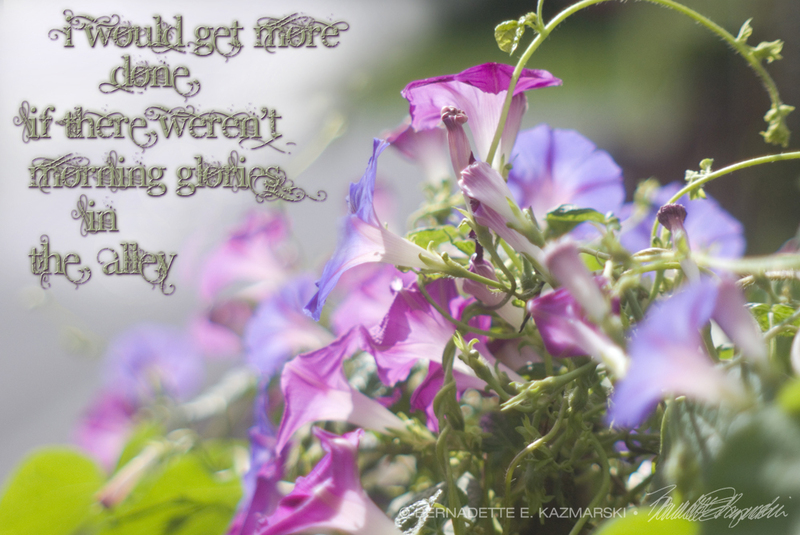 Soon the morning glories will be grayish withered memories and I may be too, so it was extra important to capture it.